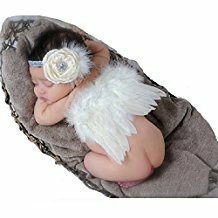 Light weight angel wings in one-piece sturdy cardboard base that defines wing shape with feathers and marabou glued to fully cover on both sides. Two attached shoulder straps are elastic for easy wear. An embedded iron wire allows the wings to be flexible enough to bend to different angles and strong enough to stay at the bent position. Excellent props for baby photography or costume. 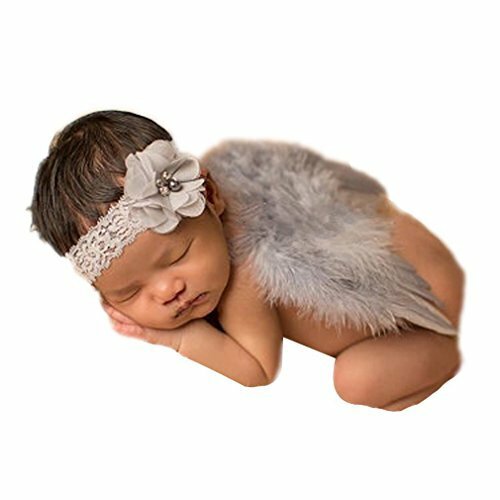 The wings come in packaging that safely protects the wings and makes it a great baby shower gift. Hand made of natural feathers, brand new. Do not use if allergic to feather. Delicate in nature, please handle with care. Adult supervision required. Exclusively made for and sold by FashionWings4u on Amazon. Visit website for more use and care instructions. 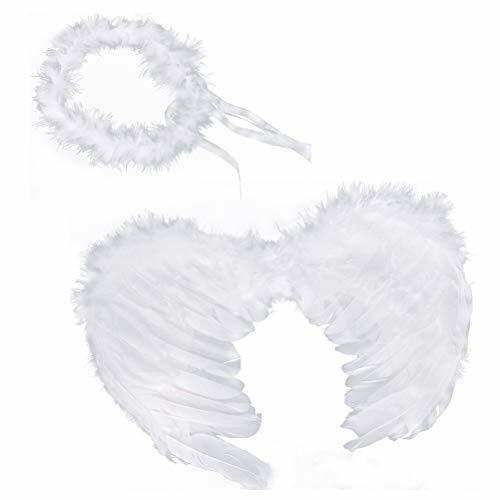 Light weight angel wings in one-piece sturdy cardboard base that defines wing shape with feathers and marabou glued to fully cover on both sides. Two attached shoulder straps are elastic for easy wear. An embedded iron wire allows the wings to be flexible enough to bend to different angles and strong enough to stay at the bent position. 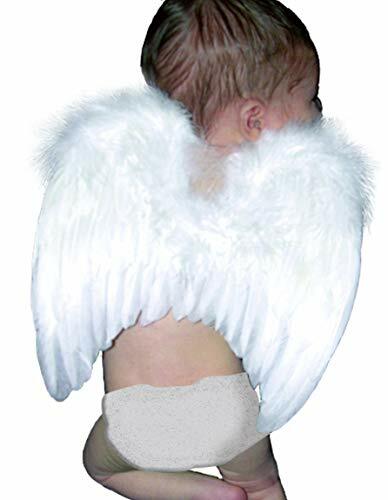 Elastic marabou angel halo included, recommended to be used after baby has grown hair. Excellent props for baby photography or costume. 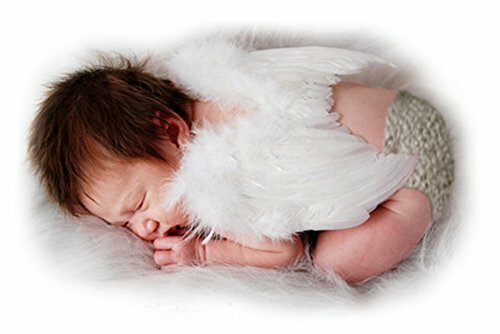 The wings come in packaging that safely protects the wings and makes it a great baby shower gift. Handmade of natural feathers. Brand new. Do not use if allergic to feather. Delicate in nature, please handle with care. Adult supervision required. Exclusively made for and sold by FashionWings4u on Amazon. Visit website for more use and care instructions. A sturdy piece of cardboard is used as a base to define wing shape with feathers and downs glued to fully cover on both sides. Two elastic straps are attached for easy wear on the shoulders as costume or be hidden for photo shoots. An iron wire is embedded in the wings so they can be bent to different viewing angles. 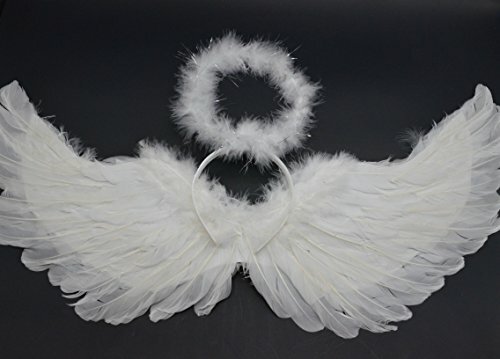 Angel halos (boas/rings) are made of super soft full-fluff or half-fluff marabou. The halo has an elastic band to fit different head sizes. Hand made of natural feathers. Delicate in nature. Handle with care. Note: minor feather and marabou fall off is common when in contact. Do not use if allergic to feather. Wings are bendable at center. Loop straps to knots and hide under arms if too long. See full instructions at website.